Leaves and other yard waste can clog storm drains and cause algal blooms when they reach our waterways. Instead of piling leaves in the street, use them as a great natural mulch or fertilizer in your yard. They also provide an excellent addition to any compost pile. Mulch: Prevent weeds and save money on mulch. Put chopped leaves on vegetable and flower gardens and whole leaves under shrubs or around trees. Mow: Shred smaller amounts of leaves with your lawn mower right onto your lawn. The small pieces quickly break down, releasing nutrients for a green, well-fed lawn. Compost: Compost is a free way to create rich soil! For more advanced gardeners, chopped leaves make a great compost addition. Place composted leaves in your vegetable and flower beds. 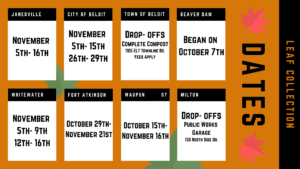 For more information on composting, visit Wisconsin Department of Natural Resources. Click here to learn more about leaf collection costs! Interested in learning more about leaf management and mulching? Click here to find out more. If the above options for reusing your leaves are not possible, follow your municipality’s guidelines for leaf disposal.